Play was rough for both teams on Wednesday night, but it was Algonquin who prevailed with a 3-2 victory. (Left to right: Sydnie Davies reaches for the puck while Callie Jackson gets physical with an opponent). 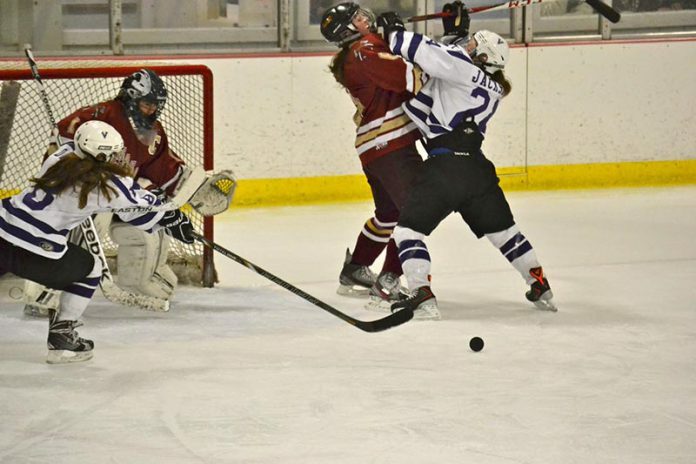 It was a physically rough game and an emotionally rough loss for the Martha’s Vineyard Regional High School girls hockey team, who were defeated 3-2 by the Algonquin-Hudson Tomahawks in their first and final playoff game of the 2013-2014 season on Wednesday, Feb. 26. Though the Vineyarders held their own against the aggressive Algonquin team for much of the third period, they were unable to put the puck past stonewall Algonquin goaltender Sasha Barry. The Tomahawks led off with the first goal of the game with four minutes remaining in the first period. The second period was a fierce exchange of both goal scoring and penalties. Algonquin clocked the first goal of the period at 12:22, but Callie Jackson of the Vineyarders answered only a minute later with a shot assisted by Belle Dinning and Alex Clark. With the score narrowed to 2-1 Algonquin, tensions were high, and a succession of penalties left both teams shorthanded for much of the remainder of the period. Each team racked up two tripping and one roughing call before the period was through. With both teams at full strength, Algonquin scored again with a minute remaining, insuring their lead at 3-1. The Vineyarders did not go quietly with the arrival of the third period. They held off Algonquin with strong defense throughout the period. Sydney Davies helped close the gap, tucking in a power play goal at 4:11, assisted by Kylie Hatt. Despite keeping the puck in Algonquin’s zone and firing promising shots on net until the final moments of the game, the Vineyarders were not able to net another goal. The Vineyarders finish their season at 10-7-3. 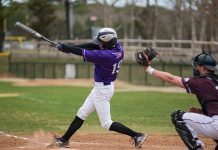 Algonquin-Hudson went on to play Falmouth on Saturday, March 1, but lost 2-0. Falmouth, Burlington, Wellesley, Milton, Westwood, Shrewsbury, Sandwich, and Medway are the eight teams remaining in the MIAA Girls Ice Hockey Division 2 state tournament.